The concert begins at 6 pm and lasts about an hour or so. The lawn in front of the historic Ingham County Courthouse in downtown Mason. The concert is FREE. Register button is only for member sponsorships. The Mason Optimist Club will be selling hot dogs/brats from the grill, chips, and pop as a fundraiser for Mason kids' programs. 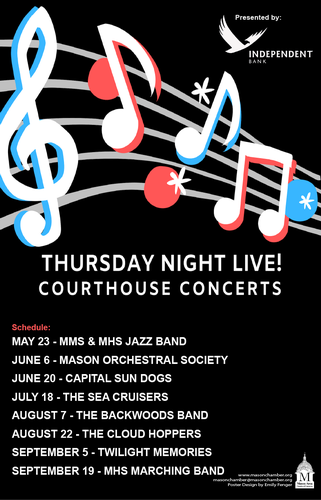 “Thursday Night Live!” is a summer series of free musical entertainment held roughly every other Thursday evening from the end of May through the middle of September starting at about 6 PM. Now in its 15th year, the series is hosted by the Mason Area Chamber of Commerce and sponsored by area Chamber member businesses in order to bring a variety of musical experiences to our community and to bring attention to our beautiful and historic downtown. Concert-goers of all ages bring lawn chairs and blankets to sprawl on the lawn and enjoy live family entertainment.